Silver Lake Recreation Area in the Croom Tract of the Withlacoochee State Forest is one of the best all-around destinations you'll find if you like camping, hiking, biking, boating or kayaking. 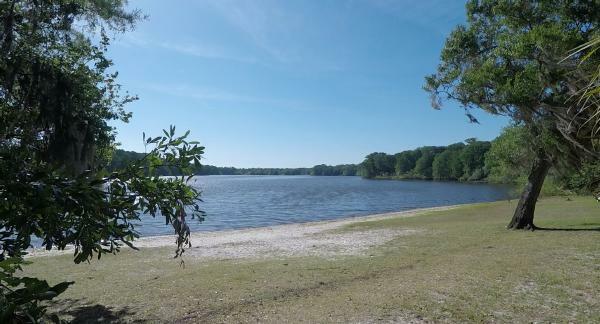 With three separate campgrounds, three boat ramps/kayak launches, easy access to the Withlacoochee State Trail, scenic hiking trails, and a nice day use area, it has everything you'll need for an extended outdoor vacation or an afternoon getaway. The day use area provides space for picnicking, and a large pavilion, along the northwest shore of Silver Lake. A boat ramp suitable for launching large motorboats, as well as kayaks or canoes, provides access to the lake and the Withlacoochee River. Restrooms are located near the pavilion and parking area. Pets are allowed on a leash. The Silver Lake Campground is located near the main entrance of the recreation area, and offers 23 tent or RV campsites with electricity and water hookups The Cypress Lake Campground has 34 campsites suitable for RVs or tents, also with electric and water. Both the Silver Lake and Cypress Lake Campgrounds have a boat ramp for small boats or kayaks to launch onto Silver Lake. Each campground has centrally located restrooms with showers. Pets are allowed in both campgrounds. The Crooked River Campground is for tent campers only. It is located further south along the Withlacoochee River. River access is provided via stairs that go down to the river bank. The 20 campsites at Crooked River Campground do not have electric service. Restrooms and showers are located near the campground entrance. No pets are allowed at this campground. Short hiking trails extend throughout the Silver Lake Recreation Area, and along the river. A trailhead for the Croom River Trail is provided near the entrance to the Crooked River Campground. This 5.3 mile hiking trail follows the Withlacoochee River to a southern terminus at the Ridge Manor trailhead of the Withlacoochee State Trail near State Road 50. The paved multi-use Withlacoochee State Trail runs past the Silver River Recreation Area, and provides a nice return route for the Croom River Trail.